We are leading on calls for radical action to lower the nation's sugar intake, with measures ranging from lowering the recommended daily allowance, through to action on marketing, labelling, and sales taxes, and supervised tooth brushing schemes for younger children, all to help prevent tooth decay. What are doing about protecting children's teeth? A year on from the introduction of the Sugar Levy (1 April 2018), we are urging government and local authorities to step up the in the fight against tooth decay, through cost-effective programmes such as supervised brushing in nurseries. Estimates from the Local Government Association suggest HMRC have amassed over £300m in revenues. We believe that less than 2% of current revenues would be enough to bring supervised brushing programmes to 5-year-old children in the greatest need. To date no levy revenue has been earmarked to combat tooth decay. One of the most important messages that dentists can give to patients is to remember that it is not just the amount of sugar you eat or drink that causes tooth decay, but also how often you have those sugary foods and drinks. Quitting fizzy drinks: Fizzy drinks are the largest single source of sugar consumption for children aged 11-18, and they provide an average of 29% of daily sugar intake - cutting them out for a month is an easy way to reduce sugar intake and to help encourage a reduced intake for the rest of the year, by switching to healthier alternatives. Sugar-free fizz is still bad for teeth: The fizz in sugar-free drinks is still acidic, and can cause tooth erosion, so it's much better to switch to tooth-friendly alernatives like water, milk, or a small serving of fruit juice - but this is best consumed with a meal, to avoid the erosive acidity of the fruit juice. Brush twice a day: keeping teeth clean by regular brushing helps prevent decay. Children's brushing should be supervised until the age of seven. Ask your dentist for more advice. Visit the dentist on a regular basis: ask your dentist how often you should visit and keep your appointments, if oral health problems are spotted early, then they can often be dealt with much easier. Your dentist can answer any questions you have about the best way to look after your child's teeth. Watch out for 'hidden' sugars: pure fruit juices can be a healthy choice, but the natural sugars these contain can still damage teeth. If you are offering fruit juice, drink it with a meal and only in a small glass (up to 150ml). 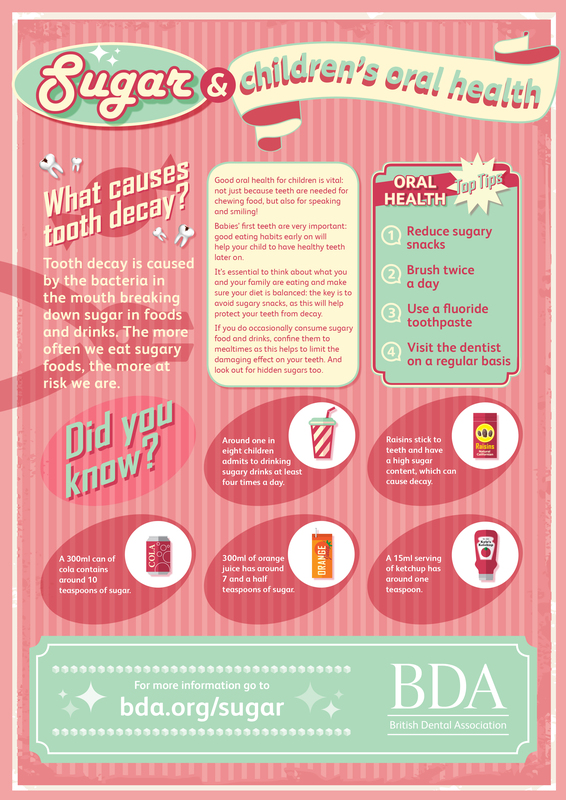 What is the BDA doing on sugar and oral health? We have been leading on calls for radical action to lower the nation's sugar intake, with measures ranging from lowering the recommended daily allowance, through to action on marketing, labelling, and sales taxes, to prevent tooth decay. Tell us what you are doing to raise awareness, tweet us @thebda #cutsugar and #gofizzfree on Twitter or email to tell us what has worked, to help us share examples of best practice. Read our latest blogs on sugar and oral health. Download our sugar poster and display in your practice. National Day Nurseries Association - resources on developing good oral health routines for children in nursery settings. Brush DJ app: this toothbrush timer app plays two minutes of music from your devices to make toothbrushing for an effective length of time less boring! ​If you'd like to be kept informed about developments on this issue, make sure your details are up-to-date on your MyBDA record and tick the box under 'contact preferences' to get latest news updates. The BDA campaigns on a range of issues affecting dentists and dentistry today. We make sure that dentists' views are represented when it comes to health policy being developed by government and other key organisations: join us.